Erin progresses. It is difficult to photograph and is much more colorful than shown here. The darkest red is not that glazed looking and the blue/turquoises don't jump out at you in person. There are actually two orange/reds in the mythical beast's head area. The white line across the ribbing is a basting thread to hold the ribbing from rolling until the sweater is blocked. 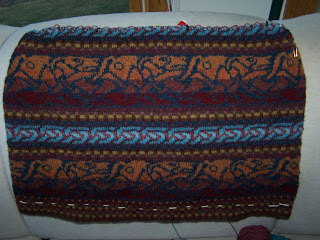 I am truly enjoying this design of Alice Starmore's in "The Celtic Collection". That book is one of the few still in print and fairly easily available. Lots more in the book I'd like to eventually make. It (for me) is one of those have to own books. 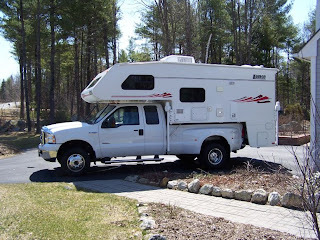 Today we finished de-winterizing the truck camper and loading all the gear for this season's travels. Went through the canvas bag holding the "Sweaters from Camp" Shirt Tail Hemmed Fair Isle pullover and made sure the pattern, all balls of yarn, needles, notes, etc. were in there. That project and one pair of socks with Socketta yarn are what will be worked on in the camping evenings. This sweater is going to get finished! Looking good, can't wait to see the finished garment. Erin is beautiful! I'm so glad to have found another traditional knitter. I guess you will be hitting the road soon. I hope you have some wonderful places to visit this year. You are making nice progress on Erin. Keep up the good work. Erin is really a beauty. Glad to see you have some sunshine. Any special plans for the summer trips?